Joining Alpha Sigma Alpha will change your life. We are an organization that strives to inspire women to lead, to serve and most of all to make a difference. We do this by having real conversations, real friendships and fostering change by being strong women of poise and purpose. If you’re interested in having genuine experiences with like-minded women, while remaining true to yourself, let’s get better acquainted. Why AΣA for your College Sorority Experience? We get it. There are a lot of sorority experience options available to you. 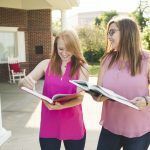 And when it comes to making a decision about sorority life, Alpha Sigma Alpha has a lot to offer. Read more about the opportunities AΣA can bring to your future. You can still have an inspiring and unique sorority experience well after your college days. Join an Alumnae Chapter to continue fostering life long friendships and serving your community.